ANTÔNIO CARLOS GOMES (1836-1896): Il Guarany. Description: Daughter of Portuguese nobleman loves noble savage in 16th-century Brazil and are threatened both by Spanish adventurers and a cannibal tribe in this work written and premiered in Italy iin 1870 by one-hit-wonder Gomes. 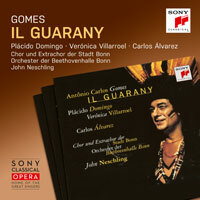 This was well-received on its first release 21 years ago, Lionel Salter saying in Gramophone “Both chorus and orchestra are excellent, and John Neschling invests the whole with a real dramatic sense. Those who like full-blooded romantic opera should not miss this.” Now you can have it for next to nothing. 2 CDs. No libretto. Hao Jiang Tian (bass), Verónica Villarroel (soprano), Plácido Domingo (tenor), Carlos Álvarez (baritone), Chor und Extrachor der Oper der Stadt Bonn; Orchester der Beethovenhalle Bonn; John Neschling.